The ground beneath me is moving in ways that surprise me. It’s like I have one contact in and one out; some things are in perfect focus while others force me to squint and rub my eye. The hardest thing is knowing when it’s meant to be blurry. Where is the bird’s eye view I’ve come to expect? I long to have my response be smooth and natural, but it’s more like a violent lurch and stumble. When I manage to back off I worry that it’s motivated more by fatigue and irritability than genuine awareness that I ought to give the girls space. Then when I stay close it nags at me that I’m creating an unnatural tether that keeps them from moving toward new things. The first day back to school was a study in spacing. It was the first time that Avery would ride the bigger kid bus with Briar, leaving Finley home for another hour and then off to ride the younger kid bus alone. Briar and Avery wanted us all to walk to the bus together, but then they didn’t want us to stand and watch right at the stop. Actually, that was Sean; he thought we should stand back a bit. Last year Briar had figured out how to get out the door on time, alone. I remember being shocked, I hadn’t been ready to have someone else decide how I would or wouldn’t participate in something. This year Ave was uncharacteristically tentative, yet she didn’t want help. She wanted to steep in the newness and figure it out herself. Finley floated between us all, moving in tight with her sisters and then away, a new independence and sense of identity overshadowing any nerves about riding alone or being left behind. 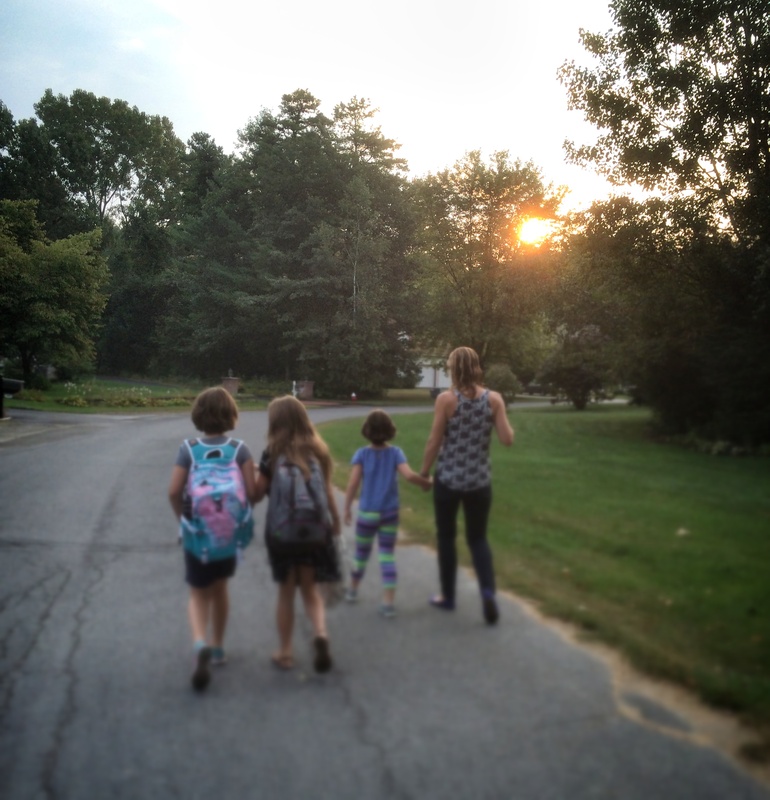 I’d been preparing for each of the girls to be at a different school this year, but there was a primal flinch. My instinct was to fight the scattering, gather them all back up in one tidy cluster. 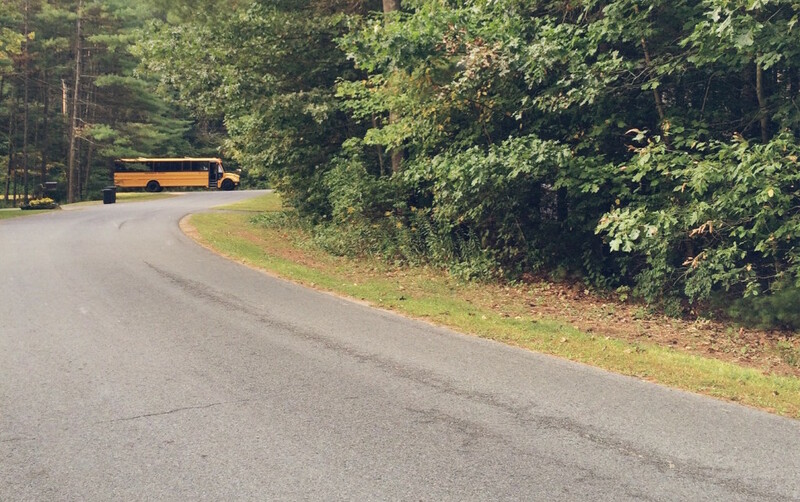 The bus drove away and as I slowly turned, I saw that Fin was halfway home. I marveled at how the four of them seemed to understand where they belonged. Sean took my hand and we walked. “This is nice,” he said softly. I loved holding his hand and watching Finley skip happily ahead. Behind us I knew both girls were excited about the new schools waiting at the end of the bus route. Is it ok to feel happy that they are moving toward needing me less? Should I not have this sadness that I’m not needed? Or that the focus is shifting? What about the frustration when I am needed? We walked up to the house and poured ourselves a second cup of coffee. I took mine upstairs to do my hair. I had 45 free minutes. I stared at my reflection in the mirror, surveyed the countertop with its tubs and tubes of skin potions. They aren’t mine; the girls have started asking about break outs. I told them I’d buy things they could use if they needed them. They’ve been washing their faces each night, earnest about this emerging need for self-care. My own creams and toners sit untouched. As the girls become undeniably closer to teenagers than little girls I feel my age more. How can the butterflies of my own back-to-school memories seem so recent, yet the reflection in the mirror such a far cry from who I was? Friends talk about kids getting bigger and free time opening up in new ways. Then they talk about how it actually gets harder. Sure, you’re not tying your kids’ shoes but you have new, more perilous responsibilities. I flirt with clinging to their stories of how it changes, taking the words as a soothing and literal description of what comes next. That’s no better than borrowing someone else’s glasses. It’s different for all of us. It really does feel as if my vision is constantly struggling to adapt to the proximity of everything, or the distance, and to understand which way I am going. Maybe it’s really my heart. I can’t get it to focus as it flutters between fearing loss and yearning to help everyone take flight. How about you? Do things get blurry from time to time? This, right here? My daily inner dialogue: “Is it ok to feel happy that they are moving toward needing me less? Should I not have this sadness that I’m not needed? Or that the focus is shifting? What about the frustration when I am needed?” You nailed it all in this post, Amanda, even down to the army of skin care bottles that is growing with my daughter as well. I feel adrift by this girl growing in my midst–I see you know exactly what I mean. It’s like the purest exhale knowing that I am not so alone in these emotions. And now I’m crying. Mine are at the same school this year, for the first time ever. It’s possibly the most bittersweet moment I’ve experienced as a parent. I adore the people they’re becoming, but my house is very quiet. I know I will adapt, but it’s amazing how even my favorite music doesn’t fill the space the same way laughter — and yes, even whining — did. It’s an impossible riddle, isn’t it? It just couldn’t be as amazing without the contradiction of emotions and wants. You’ve beautifully described a new stage of parenting for us. We’re losing any consistency in expectation–and it’s a good thing, as they want to become independent, but it’s confusing because you never know when it’s coming and sometimes they regress. So this “free time” is also not always peaceful. Blurry indeed. All of this, and also reminding myself that it isn’t supposed to feel familiar or certain. Having them do certain things is terrifying, but I have been asking them to stretch themselves forever, I have just never felt quite so keenly aware that I am reaching too. Make sense? I feel like I’m late to this realization. My son is a special needs kid, so as he is now a junior, I feel like I’ve ruined him by helping too much too long. But, would he have made it without that? Today he’s doing more and better than ever and who knows what tomorrow will bring for him. Whereas my daughter is 12, going on 20. She barely needs me and when she does I’m awestruck by how young she still is. It’s a difficult balance. The guide and the wander away. The support and the let fail. I know that I could not love them more and that we’re in this together. The rest, I guess, will just sort itself out. Oh, Danielle, thank you. I am flattered by your comment, but what I feel more deeply is gratitude for your friendship and companionship on this journey. My heart aches just reading this Amanda. The one contact is such an apt metaphor (for this former contact wearer). I feel that push and pull even now, the “go away mommy” and then the clinging. And me, wanting their hugs and my own body space back. And yet, the shifting is blurry and hard. There is no even footing on this route. No even footing, indeed. Thank you for getting this and owning the uncertainty. Sometimes I see a toddler on the street, or the younger still-little-kid child of a friend, and I struggle to remember what my girls were like at that age. Well, not struggle. It takes a moment to conjure it up, the image of their rounder, softer selves, and then it’s there, like in a photo album. Gosh, they were cute. Now, all skin-and-bones, tall and lanky, with intellectual enthusiasm and/or a good dose of sass, I find them more interesting. I miss that cute stage, but only for a moment. I am cherishing these tween years, and trying to be as mindful as I can about them as they pass. The blurry part for me is the distant future, and who they are becoming. I hope I can stay in the picture. Even if it’s just on the periphery. This is all so well stated. I feel so similarly to this: “I feel my age more. How can the butterflies of my own back-to-school memories seem so recent, yet the reflection in the mirror such a far cry from who I was?”. And I have a few kids getting bigger and getting into “bigger” issues (my almost 9 year old and 11 year old). But then I still have the 6-year-old and 3-year-old so it’s this foot in each space. It is hard to remember that the little two still need me for things that I was FULLY there to do for the big two. I have to constantly remind myself not to sigh in aggravation and also remind myself to LET the big two do more on there on . . . more than let them, I have to insist on it sometimes.